1. 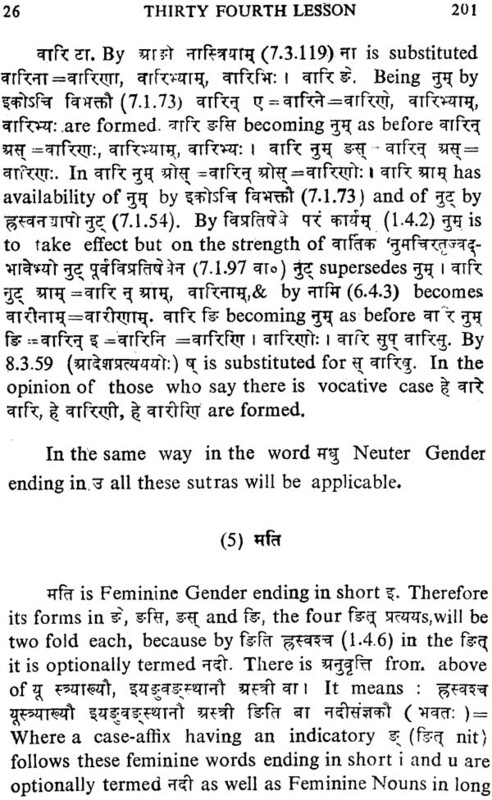 Name- Labbhuram as given by parents; Brahma data jijnasu as given by his precepter. 2. Birth and birth place- 14th Oct. 1882. Village-mallupota, p.s. Banga, dist,-Jullundher, Punjab. 3. Parents - Parents-Shri Ramdas, Sarsvat Pathak and Shrimati Parameshvari devi. 4. Boyhood-Lost his parents at the age of nine years. Some Arya gentlemen helped to educate up to tenth class of high school. 5. Special education - Left home for ever in 1912. Received formal education of Paninian Grammar from hs precepter Swami Purnanand. Received thorough knowledge of Vedangas, upangas and Vedic literature at Kashi. 6. 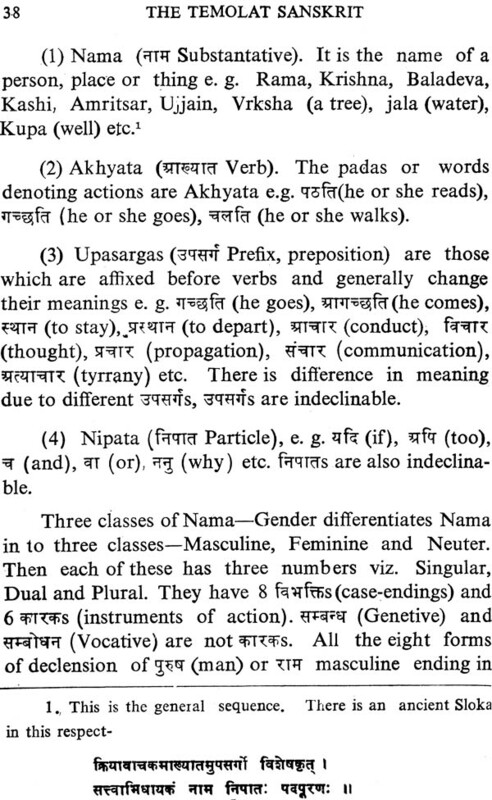 Activities-(A) Social Sanctificational work and Presidential addresses in the Vedic Seminars. (B) Academic- Imparted education in the Vedic literature at Virajanand Ashram since 1920 to 1964. 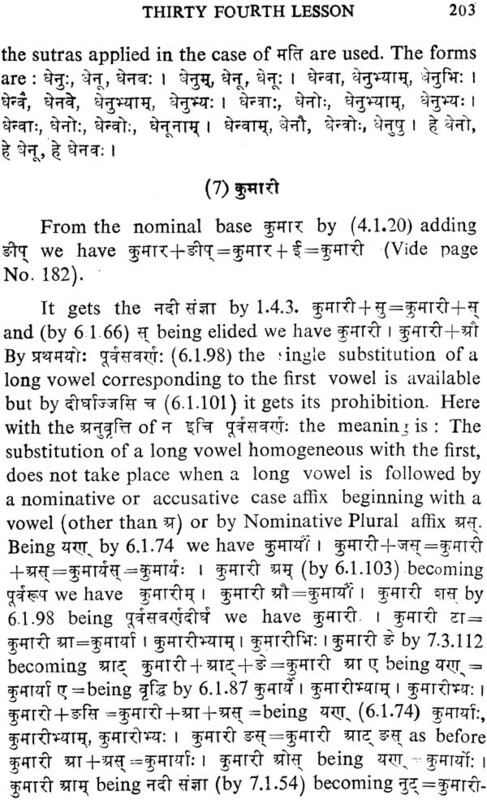 (C) Literary - Authentic glossary on the Commentary of Yajur Veda by Dayanand Sarswati, famous works on Ved and Nirukt of yask. 7. Achievements - Member of senate, academic and Executive council of S.S. University. Member of Dharmarya-Sabha, President of R.L.K. 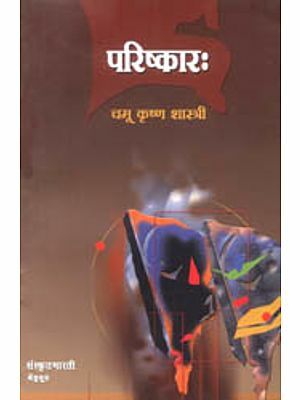 Trust, Member of Paropakarini Sabha, Editor of Vedavani and honoured as 'Rashtriya Pandita' by the government of India. 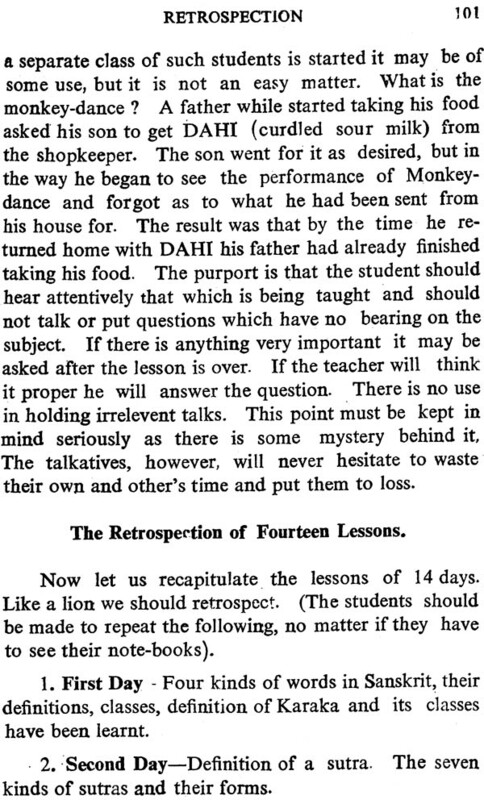 Why the Lessons were not first brought our in writing? 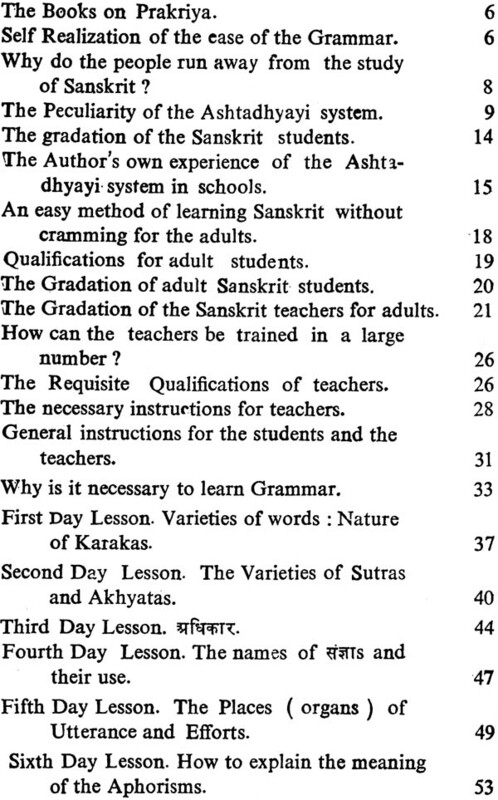 The study of Sanskrit and its Grammar according to the Ashtadhyayi System without cramming was begun in 1939-41. After wards during four or five years from 1951 to 1955 many student classes were taught according to this scheme and there was all-round success. 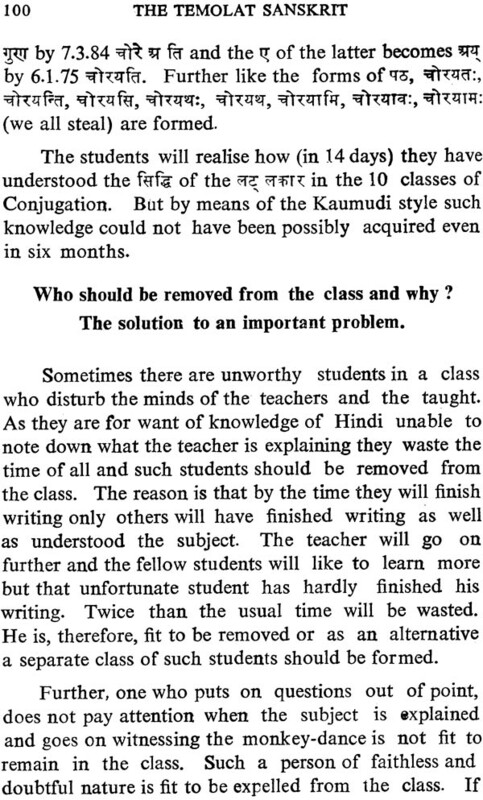 But I was not consigning them to a written form, although many students, lovers of Sanskrit, teachers and learned persons had been insisting that I should do so. 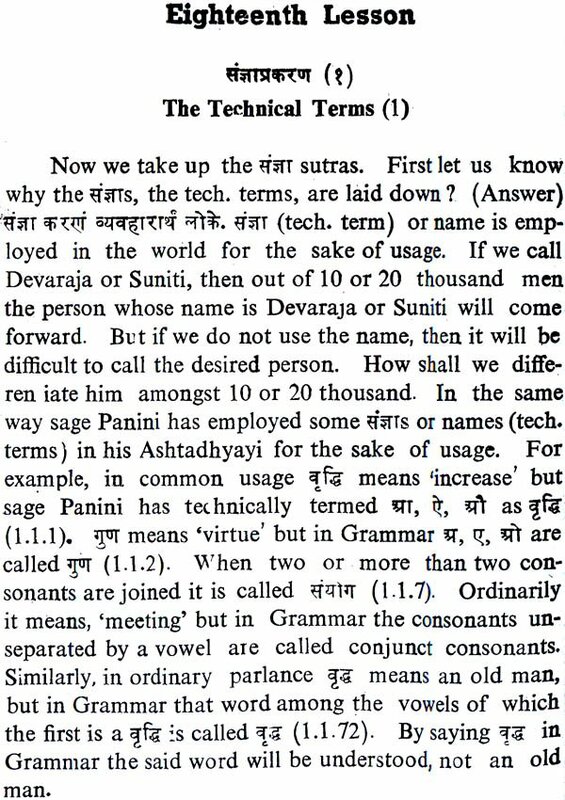 I remember that the late Shraddheya Veetraag Swami Sarvadanandaji Maharaja had been constantly and forcefully persuading me to write or compile a short book on Grammar. But I was hesitating all along that it might not prove to be an Anarsha act or one encouraging Anarshata I was not prepared to write. I always felt that Grammar could be taught only after the Ashtadhyayi had been learnt by heart and for nearly 40 years it was my firm conviction and even now it is the same, so far as those whose age is less than 16 years are concerned. How the idea of committing them to writing came about? When students of an age group more than 16 years brimming with confidence and enthusiasm came to me, a situation almost divinely contrived was created to compel me to reassess my position. They were of advanced age and bad only a few months to devote for it. 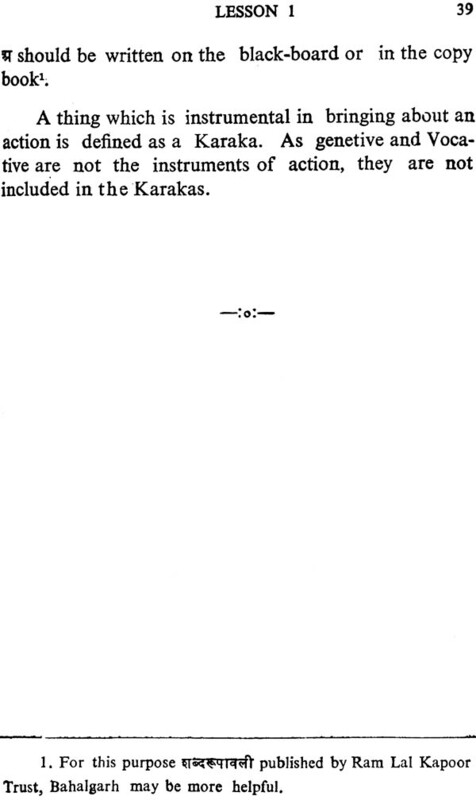 They did not like to read the Anarsha Kaumudi etc. And would run away if they were asked to cram any thing and thus give up the idea of studying Sanskrit for good. I had a feeling of goodwill for them and liked to see them advance to brighten their future. 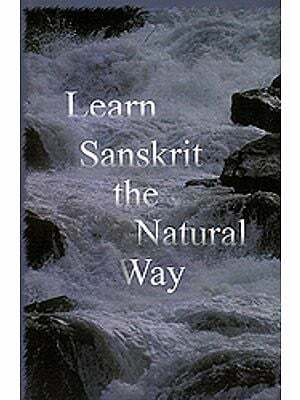 Under these circumstances my mind was agitated to think whether I should ask such people to acquire the knowledge of the Sanskrit Grammar only by cramming the Laghu Kaumudi, as there was no other way out for them. Will the Ashtadhyayi remain out of reach of such people? Will this not amount to failure of the great sage Panini? Such disturbing questions impelled me to teach the students by the Ashtadhyayi Method without their resorting to cramming. This resulted in a course of teaching the Ashtadhyayi System to the grown-up students. The proverb 'Necessity is the mother of invention' proved true here also. Even after successful experiments of teaching grown-ups in several batches I was hesitant to write down these lessons, because I had my own doubts about people cramming these lessons too. This idea gripped my mind rather deeply. But then I was constantly getting encouragement and the question of the difficulty of students and teachers who had great confidence in the Ashtadhyayi stared me in the face again and again. So, ultimately I relented to give these lessons which were lying within me a written shape as it is at present. The greatest impetus which I received was on 18the April 1954 at the time of the opening ceremony of the Panini Mahavidyalaya by the Sanskrti loving home minister, the Hon'ble Katju at Delhi. The presidential address by revered Tandanaji, a true patriot, renouncer, ascetic and a prominent leader of our country, greatly encouraged me to commit these lessons to writings. 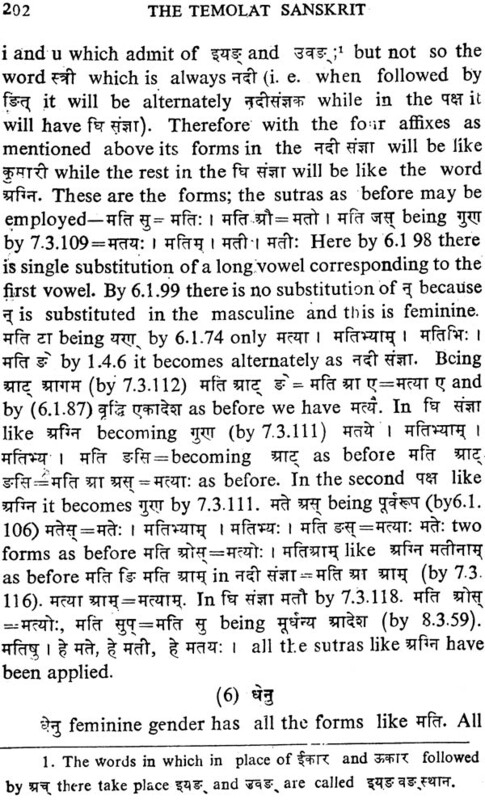 It is the result of all these impulses that these lessons are coming to the loving readers of Sanskrit in writing. After all this I started writing these lessons to publish them as articles and expected to finish them in 10-20 pages. Still there was no idea or possibility to publish them in a book form. When I started writing I wrote the article exactly as I myself was teaching the subject to the grown-up students. It covered 77 pages of the First Edition. I first intended to give one form or 8 pages every month but it was started with 16 pages. This is the reason why adequate attention could not be given while preparing them for a book form. Its size also did not conform to the standard book form. 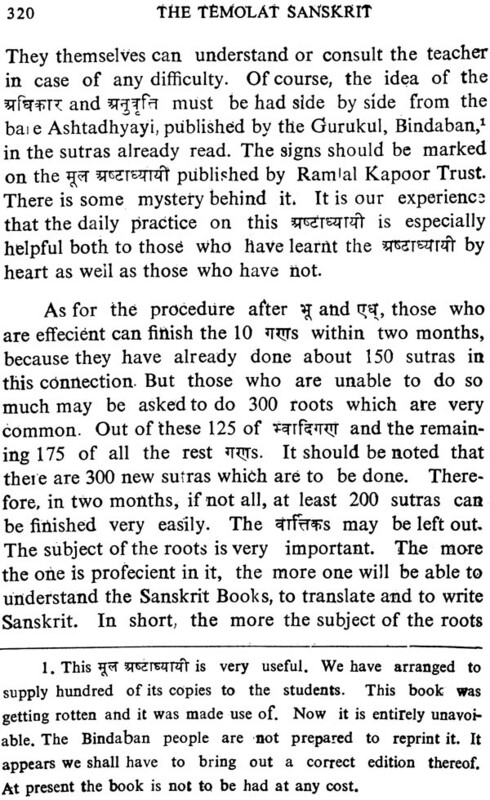 The idea was and still is that whatever difficulties pointed out by students and learned scholars after using these lesson or suggestions given by them would be considered and necessary instructions given or sufficient light thrown on the subject so that the river of knowledge of Sanskrit or its Grammar might rapidly flow throughout the country. Under what circumstances were the Lessons written? The readers will wonder as to why the lessons should not have been written together and the press copy made out. On the one hand the Vedavani was to be printed by the 20th of every month, while on the other, I used to start writing articles which took about 32 pages of the foolscap size, on the 14th or 15th of the month. After finishing the article I used to pass it on to other for preparing a copy for press. It would have been better if this had also been done by myself. I fail to understand how I could write so much. 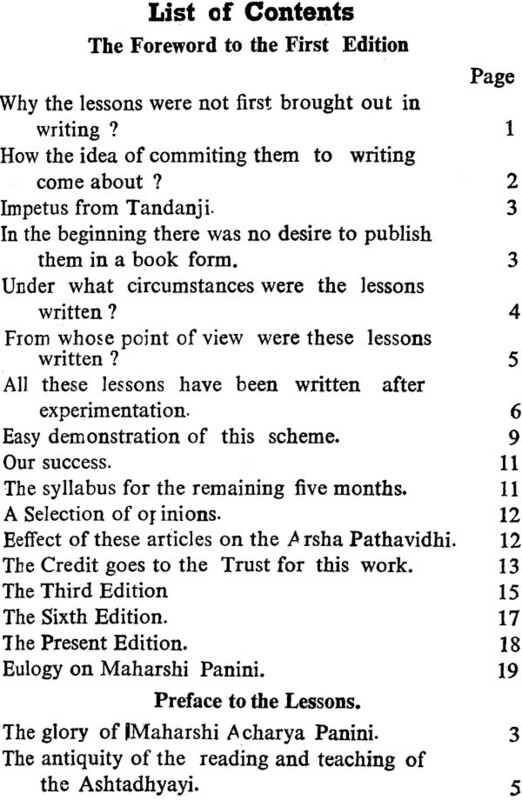 Dear Yudhisthira Meemansaka inserted the news in the Vedavani that the lessons would be published in it. Now the writing of articles became unavoidable. I had to go out of Kashi which was also a hinderance. The proofs were also not corrected in a satisfactory manner. On account of these reasons some mistakes happened to remain through an oversight, some text was omitted and the Matras were broken. Ordinary printing mistakes and additions and alterations have been appended as corrigendum at the end Readers are therefore, requested lessons after making necessary corrections. In the next edition all these and other necessary corrections will be done. 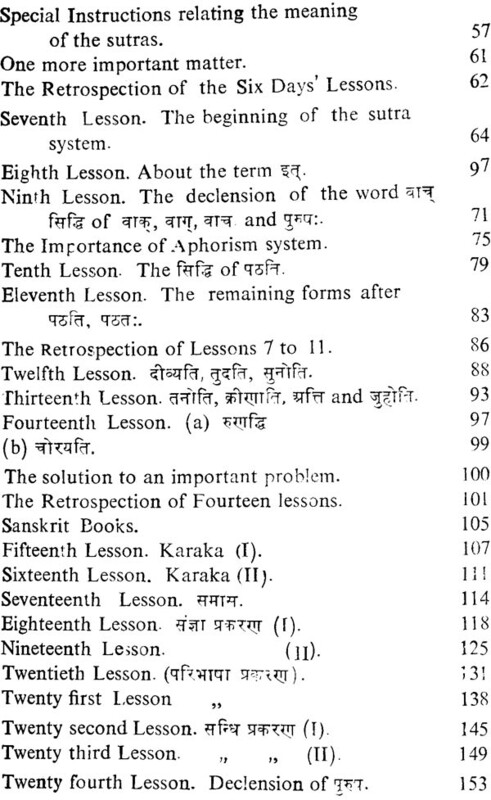 From whose point of view were these Lessons written? 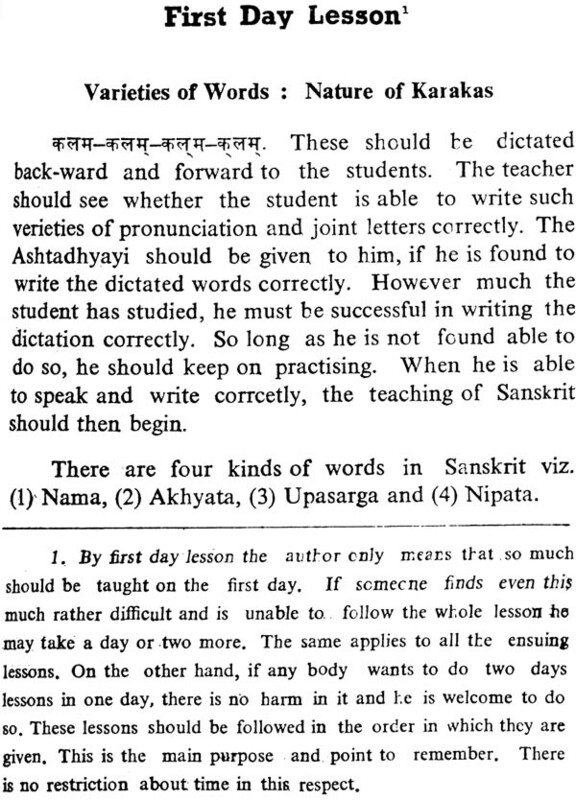 Generally these lessons have nearly been written in the same style, order and manner in which I have been teaching or now teach them to the grown-up students. There is now no doubt or difficulty about the success of this style, order or manner. 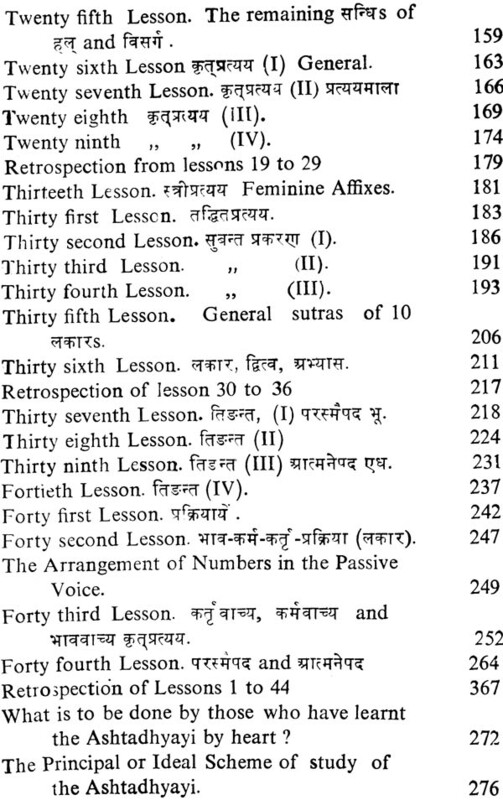 But the question arises; for whom are these 44 lessons meant? In my opinion both the purpose, namely of teaching and learning are served by them. Those people who have studied these lessons themselves without the help of a teacher have also come to me. Only yesterday Shri Master Narottam Das Agrawal, Retired Head Master Junior High School, Baragaon, Distt. 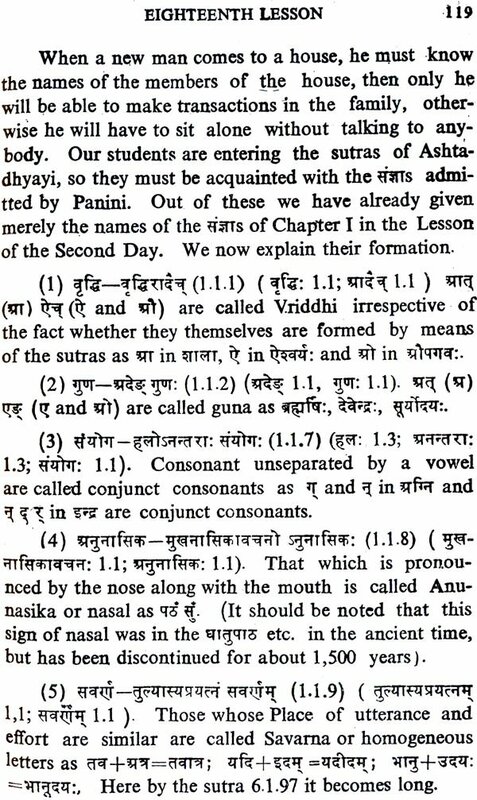 Benaras, came to me for the first time and said, "I have read myself 35 of these lessons as published in the Vedavani and have understood them quite well. Now please instruct me further. I replied, "Unless I test you that you have understood 35 lessons (which I doubt) how can I teach you further. It was a pleasant surprise when he explained to me all the 35 lessons correctly and so I gave him further instructions. In this way many persons told me and wrote to me. Therefore, these lessons are equally useful for those students who study them by themselves without the help of a teacher. If those persons who can make their own arrangements for their lodging and meals at Kashi (because I regret my inability to help them in this respect) and are able to read at least some lessons with me, it will be an excellent matter. 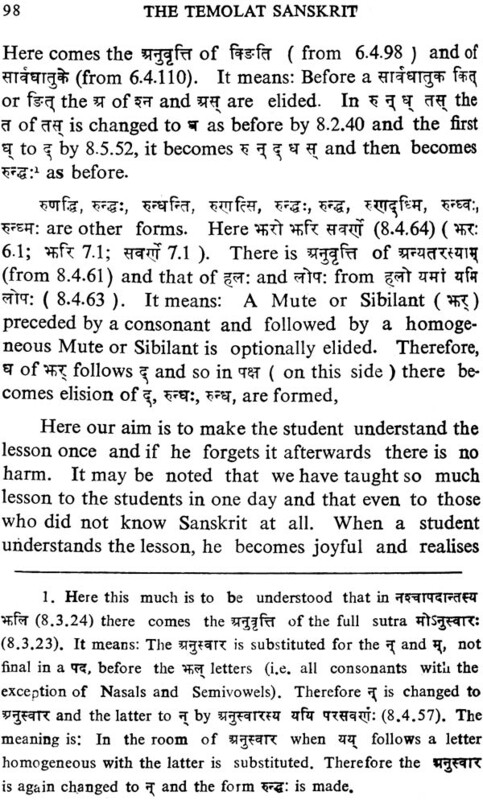 Teachers who have learned the Ashtadhyayi by heart may teach grown-up students according to this method. If how ever they, in order to gain personal experience of this system, stay with me (under the said circumstances) for 15 days at least, they will soon be able to acquire the method of teaching according to this method. Further it is possible to remove the difficulties through correspondence. Here the students who study through this scheme are always present, though we may be found or not. So these lessons of ours are useful both from the students and the teachers points of view. If those who read at home, come and study with me once even for 15days for personal experience, further work may be done through correspondence. Through I try to reply letters promptly, yet through the load of work there is some possibility of delay. The readers may please note that besides this work I remain engaged in other items of work such as the commentary on the Veda, teaching of the Arsha literature, editing of the Vedavani etc. Despite my disinclination I have to go out. How can I engage assistants and that too to what extent? 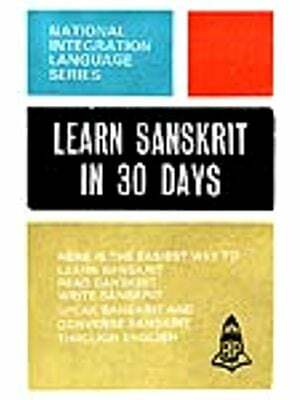 The readers should remember that all these articles of the Sanskrit Patha Mala have been written after gaining experience of teaching various classes of grown-up students successfully. They are not based on mere hypothesis. For the benefit of our dear readers we give below particulars of the classes of the grown ups in full detail. (1) In Sultanpur (Oudh) a class for the grown-ups started on 5th April 1952 and lasted till 15th June 1952 and was personally taught by me. There after from July 1952 to April 1954 three classes viz 10th, 9th and 6th lasted for four years in which 100, 71,62 and 55 students were taught according to the Ashtadhyayi system. In this way 10 classes were held at Sultanpur and about 275 students were coached. There were many Mohamadan students who studied the Ashtadhyayi here. (2) [A] In Kashi, there classes were held at Lahori Tola where 26,16 and 26 students were taught were held separately. There were seven classes during the years and about 84 students attended. [B] In June 1953 at the camp at Motijheel there were 100 students but in the end only 60 grown-up students were taught in four classes. [C] In Motijheel from July 1953 to December 1955 there were 60 students as under, in 1953, two classes, 1954, two classes and 1955 six classes of these 15 were under advance course. (3) In the Panini Mahavidyalaya Delhi, teaching was done From April 1954 till December 1954. Two classes in the Satyanavaya Temple and Jawahar Nagar were held for a few days. 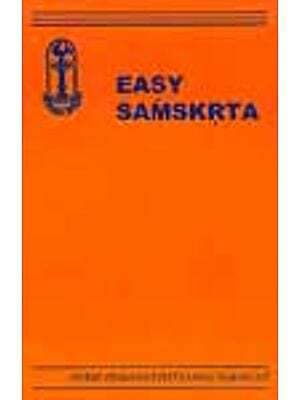 In Karol Bagh and Hanuman Marga there were classes at each place for about one and half years. In the Birla Mandir two classes were held for about six months. There were, in this way, about seven or eight classes in Delhi with approximately 250-300 students in all. In the beginning I devoted one month's time in Delhi as also a week's time in between. In this way from 1952 to the end of 1955, 15 and I held 25 classes by others. The latter, how ever, were not up to the mark and I do not wish to point out their short comings here. 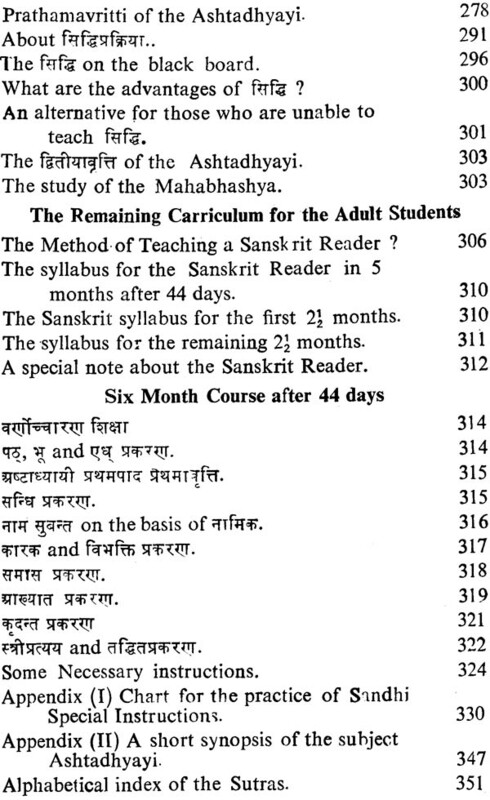 Therefore after teaching 25 classes in about four years I published this series of articles on Sanskrit Pathamala in the Vedavani when passed by my friends and now the same is being brought our separately. 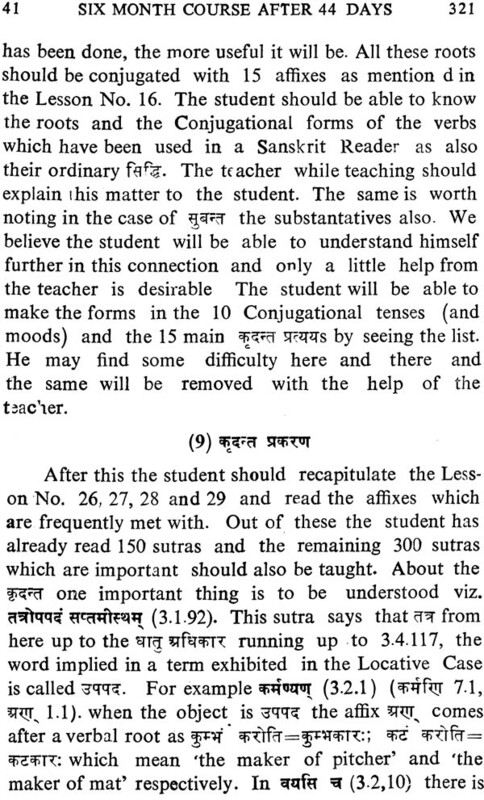 These articles have proved and are proving very helpful in guiding students who learn by the Ashtadhyayi Scheme without cramming as well as teachers who teach by the above method. 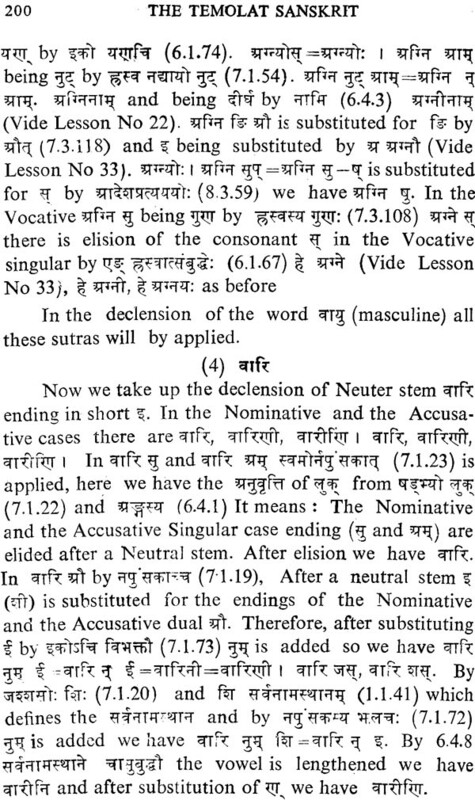 In order to bring this scheme to the general public and as a result of loving impulsion from many gentlemen these lessons are being published separately in the Vedavani so that those admirers of Sanskrit who were not able to get the relevant issues of the Vedavani might not be deprived of these lessons. It is hoped that their next edition will be an enlarged and revised one. If teachers are given scholarship during the training period much work can be done. Here the Government help is desirable. All persons who want to test this scheme in whatever manner are welcome to do so. If arrangements are made for meals of 10,000 students at Kashi for five years, this scheme can first be propagated at Kashi and in the whole of India and finally in the whole world. 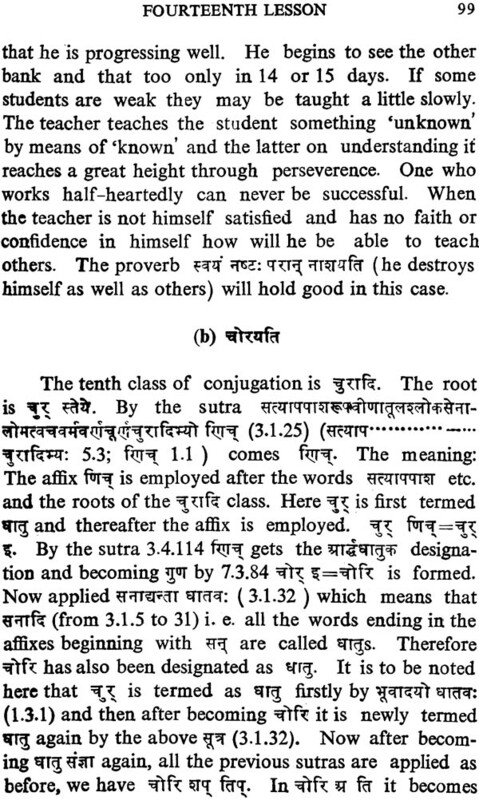 In this way the great work of Sanskrit propagation can be made possible.